WINNING—Campus News staff with their awards at the regional convention. CN/Steven Adamo. 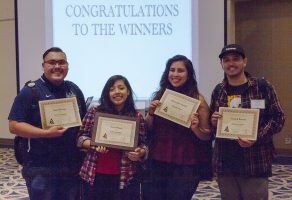 East Los Angeles College Campus News won four awards at the Journalism Association of Community Colleges’ SoCal Conference on Sept. 29 at California State University, Fullerton. The awards won were for the On the Spot competition, which is when community college journalists compete in competitions at the conference. The winners were Andrew Ayala, Kevin Camargo, Melody Ortiz and Julie Santiago. Santiago won first place in News Photo. This was Santiago’s fourth JACC and the first time she won first place. She said that her winning first came as a surprise. Santiago said that she felt pride because taking photos is something she likes doing. Santiago also said she showed the award to her mom. “ She would look at the frame then look at me, then look at the frame. She was happy,” Santiago said. Melody Ortiz won fourth place for Editorial Cartoon. This was Ortiz second time competing in a JACC competition and she said she was caught off guard but not at all surprised. There were a total of 17 Southern California community colleges with 159 delegates who competed. Ortiz says she was still excited for winning but would’ve have been more excited if she won at a State Conference. She said that she showed it to her family and posted it on Facebook and that her grandma thought Ortiz had graduated. “She put a graduation cap in her reply so I don’t think she knew what it was,” Ortiz said. Andrew Ayala won an honorable mention for Critical Review. Ayala received his award differently than the other winners. The person who was announcing the winners had forgotten to say Ayala’s name with the rest of the winners in that category. “I was shocked when he called my name but I didn’t have as much enthusiasm,” Ayala said. Kevin Camargo won third place for News Writing. “It was my first time competing in something I felt comfortable writing in. I was proud of myself as I turned in the On-The-Spot story but I wasn’t too confident,” Camargo said. He says as the announcer was saying the placements that he didn’t think his name would be called. When his name was called, he said he was caught off guard. “It didn’t hit me until I came back to my fellow staff mates and took a closer look at my certificate,” Camargo said. He said that he was very proud of himself. SoCal JACC was organized by ELAC journalism professor Sylvia Rico-Sanchez.